I find it hard to read on coaches, never mind brainstorm viable business ideas, yet South by Southwest (SXSW), the multimedia festival, have just challenged some e-trepreneurs to do just that. 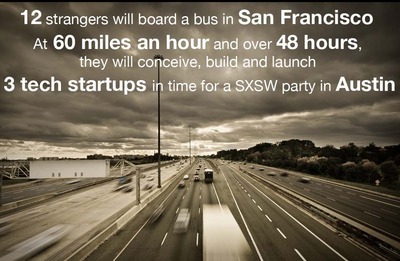 They are putting 12 entrepreneurs on a 48hour coach ride from Vegas to the SXSW venue in Austin and want them to come up as many start-up ideas as they can. This sounds like a recipe for feeling really sick IMHO, and any savvy business mind would surely realise it’s more effective to lose 4 hours getting a plane, then spend the other 44 doing some work in an enviroment that doesn’t bump around and make you feel queasy, but a publicity stunt is a publicity stunt and the start-up bus it is. It’s leaving Vegas sometime in the next few days.